Pandit cuisine from Kashmir has influences from Persian as well as Mughlai food, and is quite different from the food served in the Muslim households in the valley. Kashmiri Pandits are one of the few Brahmin communities in India who are non-vegetarians – others being Bengali and Goan Brahmins. However they mostly stick to lamb and fish. 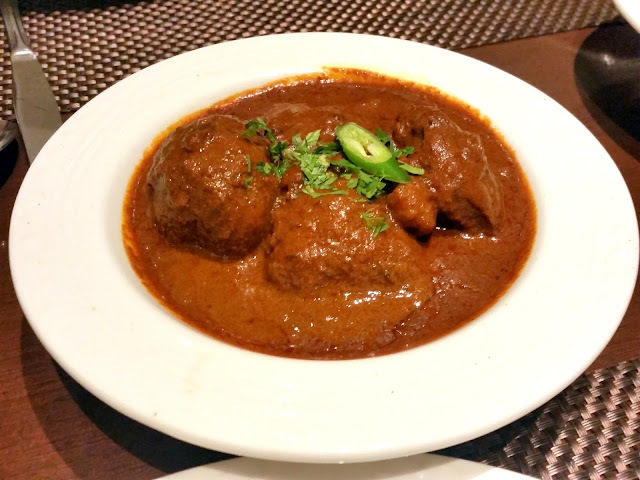 The most well-known dish from the pandit stable is their version of Rogan Josh – lamb cooked in a spicy gravy. Their cuisine mostly does not use any onion or garlic and depends on the flavours of the main spices such as fennel seeds, Kashmiri chillies, saffron and asfoetida. In absence of onions, hung curd often provides the base for the curries. Kashmiri Chef Suman Kaul from ITC Maurya is a person with a mission to popularize this cuisine. She has been organizing Koshur Saal – a festival of Kashmiri Pandit cuisine – all over India. 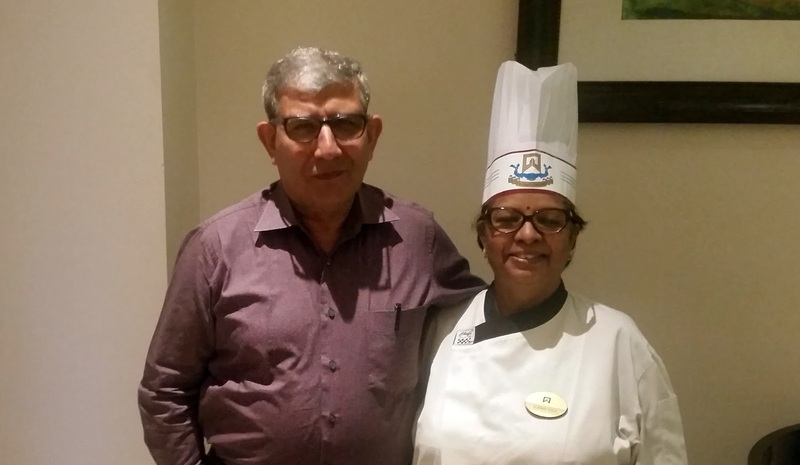 Chef Kaul has lived in Hyderabad for a significant amount of time, and is glad to be back hosting the Kashmiri Pandit food promo at Deccan Pavilion. I met Chef Kaul and her husband Mr. S J Kaul, who are both extremely knowledgeable and passionate about both the cuisines of Kashmir. Her creations were part of the popular buffet and quite a few Kashmiri dishes were on display. 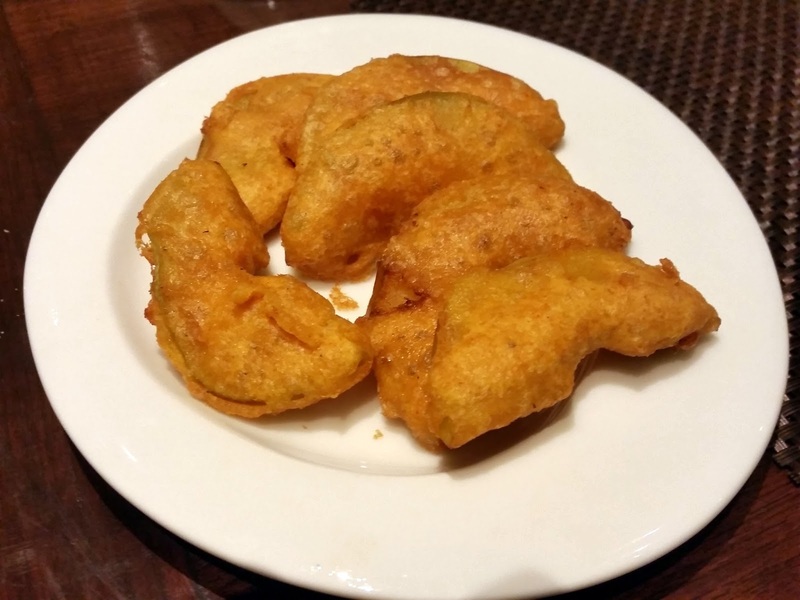 To start with, there was appetizing Green Apple Fritters, slices of green apple coated with batter and fried. More than the starter I enjoyed a very different tasting dip which was served with it, which had walnuts and pudina in it. Kabargah, lamb ribs cooked in milk and saffron and then fried in ghee, was simply delicious. The meat after hours of marination in milk and spices had become very soft and had a unique flavour. If I had to pick one dish from the entire buffet, this will be it. The main courses started with the famous Kashmiri Dum Aloo. Lot of care is taken in preparation of this dish. The potatoes are individually chosen and poked with a toothpick so that the spices are absorbed by the potatoes. The masala having flavours of elaichi, black pepper and saunf was thick and sticking to the potato, and permeating the outer layers to provide a delicious taste. 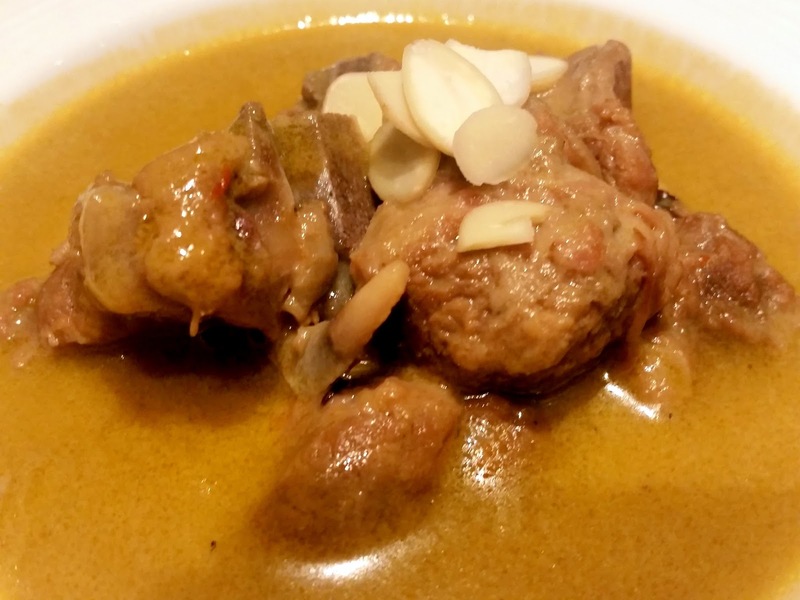 Nainey Yakhni or Mutton in a yellowish curd based gravy was another highlight of the evening. The running gravy was light and had strong flavours of saunf and hing. Chef Kaul told us that many of the gravies in Kashmiri cuisine are made suitable for steamed rice, which is the local preference. Ruwangan or dried tomatoes are also an important ingredient in this cuisine. On the day we had Ruwangan Kukkur (chicken) in the menu. Here the gravy was a little thicker and tangy, and were well paired with the rotis served along with them. 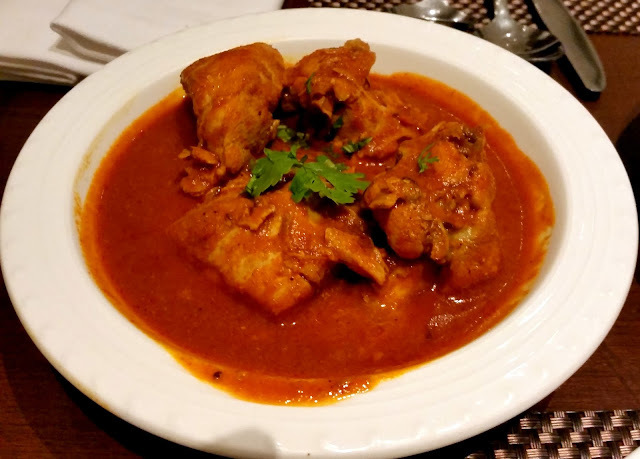 Kasher Gaad was fish cooked in a spicy gravy. In Kashmir, two main fishes which are available are rohu and trout. Whereas trout is generally suitable for tawa fried or grilled, rohu is often the fish of choice for the curries. 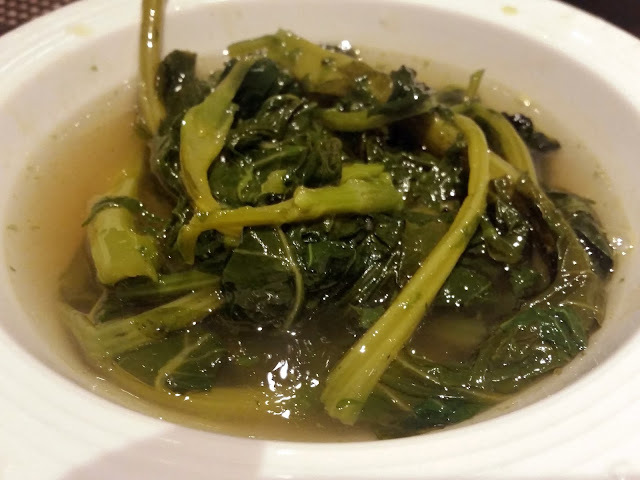 I had been exposed to Haak or the delectable leafy vegetables of Kashmir during my stay in houseboats on Dal Lake. The soupy, hing flavoured preparation of haak here was ideal with steamed rice. I was told that there are many varieties of Haak which are available in different seasons, and it is the staple food of the Kashmiris just like the North Indians have their rice and daal. One other vegetarian dish was really soul food – known as Gucchi Var, it was a delightful combination of rice with the Kashmiri Morel mushrooms. The flavours of the simple masala used here made me go for a second helping. Chef Kaul told us that she had carried with her quite a few spices for the festival. The desserts in the buffet were unique. 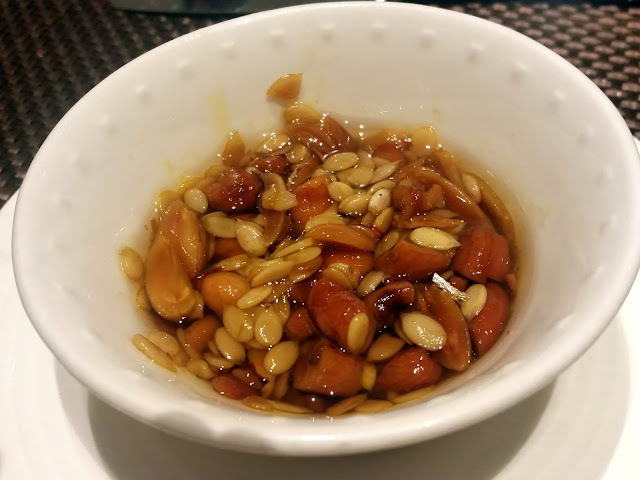 The dish of the day was Shufta – dry fruits simmered in honey with a hint of zaffran. Mr Kaul told me that this is a recipe which is getting lost over time and many contemporary Kashmiri pandits are not aware of this dish. This was perhaps the first heavy dish in the Kashmiri part of the buffet. Rice based Kashmiri Phirni brought us to the end of the meal. Almost all the items on the menu were very light, and you come out with a feeling that you have eaten authentic home food. Mr. Kaul, who was sitting opposite me passionately explained each and every dish in detail to me, which was a real treat. The promotion gives us a unique opportunity to try out a niche cuisine. There are hardly any restaurants serving the Pandit cuisine anywhere in India, so as a food enthusiast I will not miss this one. 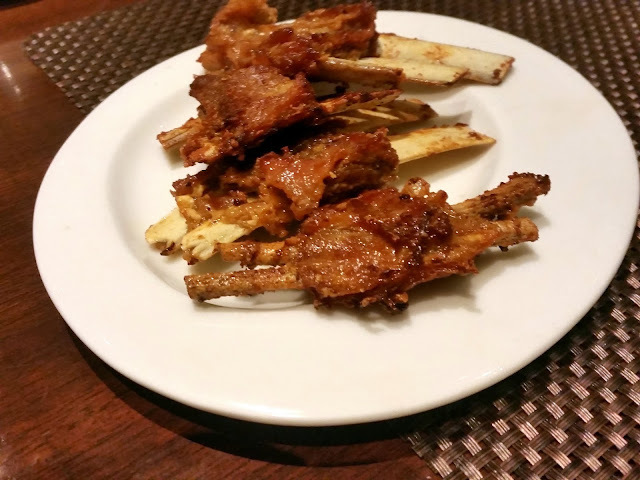 As with other promotions at Deccan Pavilion, the Indian items on the buffet are replaced by the Kashmiri delicacies. 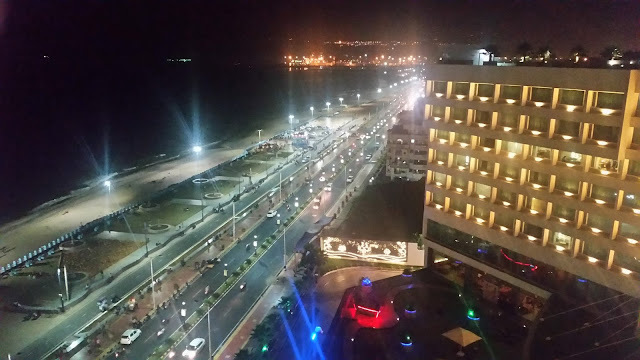 The festival is on till 13th December and is priced around Rs 1700 (all inclusive). Disclaimer: The review is based on an invite by the restaurant. However the opinion expressed in the post are honest and unbiased. Very informative Mr.Raychaudhuri. Thank you! Thank you for the lovely write up. Glad you have enjoyed the fare! Informative post. beautiful pics and detailed Information. The kabargah is more juicy and has a beautiful texture though, since they are cooked in milk and fried after being coated with yogurt mixture. Overall nice spread. :) Thanks for sharing..